Edward Ka-Spel‘s brilliance with The Legendary Pink Dots is to introduce us to isolated characters and then immerse us in their world-view through expansive and mysterious soundscapes. He begins with the most restricted, infinitesimal point of consciousness and then slowly expands it outward towards a state of ‘cosmic consciousness’ (to use the phrase of 1960s psychonauts). Musically, he often follows this template of expansion, with simple melody lines repeating and layering in increased complexity of texture. Much of the LPD’s music is an undertaking to help the listener (and perhaps composer) escape his/her own head. Lyrical phrases, musical motifs, album titles and themes recur across decades, but tonal shifts between albums are slow and subtle. Hopefully, The Legendary Dots Project, like the Residents and Sparks projects before, will provide the keen reader and listener with a giddy entry-point into the Legendary Pink Dots’ musical world. Fulfil the prophecy! Tom: ‘Stigmata Part One (Freiheit)’ opens with a psychedelic voice collage; out of the haze emerges a Casio music box with a cyclic refrain. EK-S is singing in a somewhat lower voice than usual; beginning an album concerned with societal and communicative breakdowns. It speeds up to a giddy cartoonish canter; then shifts into atonal noise for the last 90 seconds or so. ‘Klazh’ is a steadily unnerving, cyclical procession of an arpeggiated synth, increasingly open to insertions of Dadaist sound-graffiti. It is soundtrack music without specified images; the listener imagines as they will. The dissonance of this conjures up unmade weird British films of the early 1980s – somewhere in the vicinity of Kate Bush’s startling videos ‘Army Dreamers’ and ‘Breathing’ or Chris Petit remaking Norman J. Warren’s Blighty giallo, Terror (1978). ‘Love is…’ slips by: a low-key slither of love correspondence. ‘No Reason’ fades in, stilt-walking out of the swamp like a slow motion Kroll, an unfurling burgeoning wrongness. There’s a queasy, wobbly synth, with the notes of varying velocity being shifted and twisted into ungainly shapes, anchored by a solid bass guitar. Mentioned are solitude, tapes, headphones, ‘Louisa’ and ‘the end’. ‘834’ is a fragment of distended organ and vocoder that could have appeared on virtually any release so far. The misty Only Dreaming-style pop of ‘Wall Purges Night’ arrives expediently to inject a little more pep. “Swastikas shout out from walls, / they’re tattooed on a million fists. / Clenched together, safe in numbers… / waving from the precipice. / Fodder! Plod on down your icy path…” It is musically direct and lyrically kaleidoscopic, yet clearly tilting at specified targets: fascists, businessmen and a broader, systemic establishment. “Don’t kid yourself you’re civilized – it could happen anywhere. These pointed final lines mark out EK-S’ status as about the least complacent figure in music. It’s a Ballardian ballad – in the sense of narrative set to music, rather than ‘powerful’ over-emoting – and don’t you just wish there were more of those in pop? 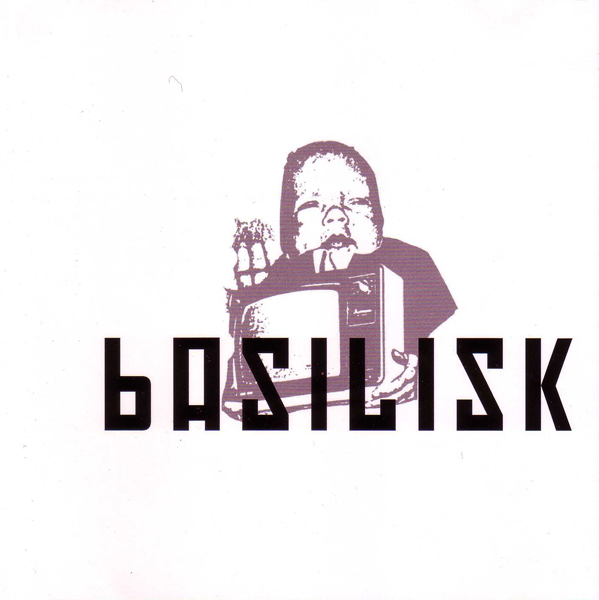 Then, ‘Basilisk 1’, with its brief, caustic sampling of Winston Churchill (“We may allow ourselves a brief period of rejoicin-”, backed by mock-fairground sounds), following the previous track’s mention of “stale cigars”. This is an instrumental, vaguely anticipating aspects of Angelo Badalamenti’s theme to Twin Peaks in its sublime dread. Coiled, baleful synths stretch out in funereal formation for nearly four minutes. Does ‘Clean Up’ indicate any sort of renewal? The song is an anesthetised, doleful sea-shanty; not so much shiver me timbers as shiver in anomie. Ka-Spel’s voice intimates his and our involvement in the ‘Second Cold War’ (1979-85). It is as bleak and deadpan as ‘Two Suns in the Sunset’, Pink Floyd’s closing track to The Final Cut, an album made in the aftermath of Thatcher’s Falklands ‘triumph’, that shares with the LPDs’ early work a sense of British society souring. A collapse of shared social values leads to the individual free-associating, though EK-S’ use of the abstract noun ‘wheeze’ – to indicate a hackneyed joke or anecdote – is a use of British sociolect: he shares his language with older generations. The lyric ‘resolves’ into a stream of consciousness whose scrambled lexical field includes allusions to the Bible, the horoscope, ghosts and the radio. There is the implication that humanity intrinsically instils paranoia and destruction; rational distinctions between the technological and supernatural have been dissolved. The excellent Philip Sandifer perceived the positive complementary potential of science and the occult in the Doctor Who adventure ‘The Daemons’ (1971); Ka-Spel is much more enigmatic about this breakdown in hierarchy. ‘Basilisk 2’ provides a terminal closure, with chilly, pixilated synth dabs again circling round and round, as an increasingly foggy undertow of synth dissonance. Basilisk is another immersive experience; like Apparition, it is entirely original – and constitutes a satisfying variation on some archetypal early LPD themes. The album then moves on to ‘Love is (Parts 1 & 2)’, which is more hard-nosed than the preceding track and anchored to a clear melody-line. With its sounds of chittering birds and dog barking it could almost be a cut by The Orb. It sounds like music that would be played in the background of a 1980s school Geography video about tectonic plates or glacial drift. The song is both comforting and troubling all-at-once, which is a trick the Dots excel at. Ka-Spel’s vocals only enters 5-minutes into play time and he provides us with the image of a dog (perhaps the same one barking earlier in the song) writhing on the floor in pain, having eaten margarine – “she won’t steal anymore”. This grotesque tableaux is followed by a somewhat more conventional track entitled ‘No Reason’, which borders on the chaotic but never tips over into complete noise. Rhythmically it’s pretty disorientating and there is a sound that evokes a cartoon whirlwind that I found distracted me from the surrounding composition! A mordant little trio of songs follow. The sound is less chilly, more bouncy and playful, but the tone remains quietly menacing. ‘834’ uses speech by means of a vocoder, recalling the use of the same in Pink Floyd’s Animals of 1977. ‘Wall Purges Night’ is next, with bitter and acerbic lyrics that – as with Roger Waters’ lyrics for Animals – touch upon fascism, conformity and the British class system. Although melodic, the track, like much of the album, induced a slight queasiness in me, which I couldn’t decide was intentional (a la Throbbing Gristle) or otherwise. The song fades out abruptly into ‘Basilisk 1’ which couples a cheap organ sound to digital-industrial droning to a rather Eraserhead–like effect. Indeed, one can imagine Lynch’s monochrome urban nightmare fitting the feel of the song perfectly. They could easily belong to the same dystopia. The song is intriguing and almost transportative, but perhaps would have benefited from a greater depth-of-sound from a better production quality (this was one of the Dots’ last truly lo-fi cassette releases). ‘Methods’ passes without incident, although Ka-Spel gives a compelling vocal performance. It is a short track and never develops into anything substantial. ‘Clean Up’ is stronger and possibly my favourite track on the album, sounding like the music a haunted end-of-pier bandstand might produce. It is pleasingly eerie and while it wouldn’t quite find a place in a list of my favourite Dots tracks, it brings a smile to my face, especially the rhyme of “paranoid adenoids” and a surprising reference to Doctor Doolittle (1967). 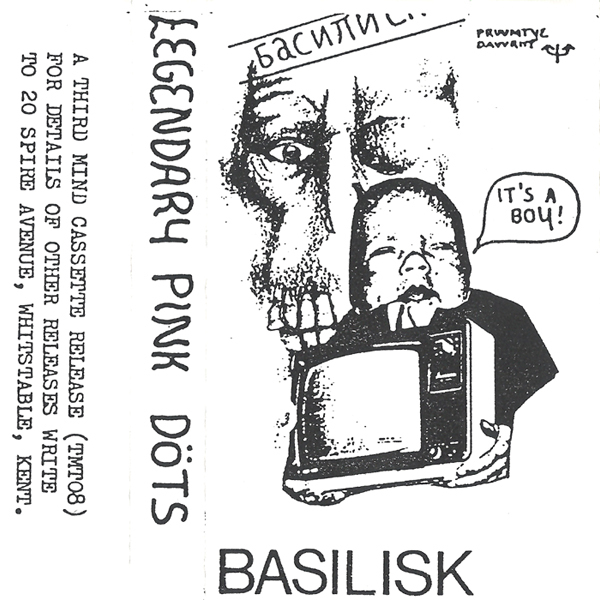 Finally, ‘Basilisk 2’ is about as long as the rest of the album combined (it was the second side of the cassette release) and though it somewhat overstays its welcome, is an intriguing experiment in sound recording. Spacey synths encircle eerie, echoing field recordings from Notre Dame Cathedral like mists. It is a track that would be well served by being played in a listening chamber with multiple speakers; perhaps as part of an immersive art installation, as one walks through a darkened mirrored corridor, or perhaps within the grounds of Notre Dame Cathedral itself. It is good late-night, or even Halloween, listening. 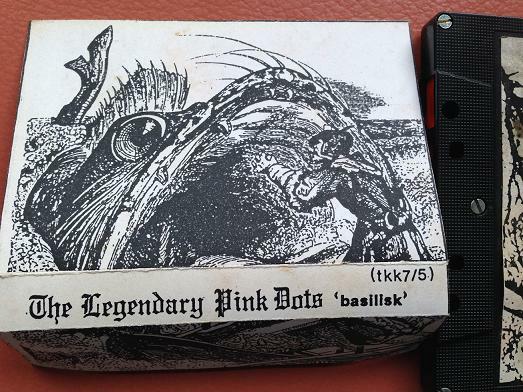 Matt: One of the fun things with the LPD project is, and I think we’ve all run into this on different albums, is that I had the CD version of Basilisk, which was re-edited/expanded with a different track listing than the cassette version (and the version found on the Dots’ Bandcamp). I wager it’s much the same version, but I purchased the Bandcamp version as well so that way we can talk about the same stuff using the same names — otherwise it gets pretty confusing, considering that while Tom and Adam’s “Basilisk 2” is the long soundscape, while on the CD that’s “Basilisk 3”, and “2” is “Clean Up” on this release. Besides, the artwork for the Bandcamp remaster is better than the CD anyway, so THERE. This version cuts the bonus tracks that were on the CD issue, but the sound is much clearer and nicer — so I’m happy with the upgrade. I actually enjoy this version a lot more than the initial listens from the CD version. It’s amazing how much effect that kind of thing can have on one’s enjoyment of an album. And but so anyway, the actual review! The vocals on “Stigmata Part 1 (Freiheit)/Klazh” actually remind me a little bit of Kurt Wagner from Lambchop, but that could just be because I’ve been listening to a LOT of Lambchop lately. As much as I like Edward Ka-Spel’s usual voice, I like this deeper version better — it’s a little less reedy, and fits in better, almost as a counterpoint to the trebley synths. LPD, especially on these earlier tapes, tended to the treble end of the scale in terms of sound — and again, that’s not a criticism, I like treble! — but it’s nice to hear a bit of a wider sound palate. And I wonder how much of this is due to the actual media of these original albums. Sort of how They Might Be Giants realized that long notes made their Dial-A-Song machine drop the call, so it influenced their songwriting. Treble sounds tend to make the leap to cassette tape better than bassy ones. The next cut, “Love Is (Parts 1 & 2)” has some nice synth-work on it that reminds me a bit of the Residents — but oddly, a bit closer to the MIDI era, like God in Three Persons than what they were doing at the time, The Mole Trilogy. (It also happens to share the title of a cut from The Commercial Album, but I’m pretty sure that’s coincidence.) Part 2 of the song, though, resolves into a more-straightforward LPD song, if such a thing exists. “No Reason” is a great, dark song with a driving bassline and cool synthesized atmosphere — I love the interplay between the bass and the squiggly synth. I get a slight Flying Lizards vibe off of that — the bass has a dub sound, which probably is the cause. It’s one of the handful of Dots songs that sounds like it was fun to play, like it’s based out of a jam session. I quite like the drums on “834”, particularly combined with the rinky-dink type of organ. It makes it sound like an all-skate gone strangely sinister, and it’s a great complement to “Wall Purges Night”, which then gives us a little taste of what’s to come with “Basilisk 1”. After that is “Methods”, which I have to admit doesn’t grab me much. It sounds a bit too much like what’s come before without bringing a lot of newness to the table. On the other hand, “Clean Up” is a lovely little waltz that ends up being the perfect lead-in to “Basilisk 2”. On the subject of that track, one thing I find interesting too is that on the CD version that I was listening to initially, the side-long soundscape “Basilisk 2” (or “3” on that version) was a real slog to get through — but this version is less so. I’m not going to lie and say it’s #1 on my hit parade or anything, but listening to it now, it’s engaging. Perhaps overly-long, sure — but it’s not the ordeal I was dreading on listening to the new-to-me version. I think I was initially dreading writing this review, just because my initial listens of Basilisk did not grab me — but I’m glad that I realized that the 2013 remaster of the album is Where It’s At. Once I started listening, I realized that my ideas for the lukewarm-at-best version of this review would all have to be scrapped, as it turns out that I actually quite highly recommend this album. And if you’re one of the folks, like me, who had the earlier CD issue, I recommend spending the eight bucks and getting the remaster. It’s almost like a whole new album — one that’s among the best of the Dots’ output so far. Happy birthday to The Legendary Pink Dots’ Edward Ka-Spel!